03/02/14 2014 RNA PADDOCK TO PALATE – ENTRIES CLOSING SOON! 28/10/13 There were only a small number of entries at the 2013 Royal Geelong Show with 6 females representing 5 studs. Class results: Heifer over 12 mths, not over 16 mths. 1st. Brookvale Hannah S. Van Eyle 2nd. Cumbria Bewaldeth Lady 30th. S. Van Eyle 3rd. 30/09/13 Beltie Steer in Tops British Purebreds in Heavy Domestic Category for Ribeye at Melbourne Royal! 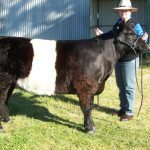 Warialda Belted Galloway Stud have been awarded a medal for their Belted Galloway Beef at the recent Produce Awards. Since 2005 they have been marketing beef themselves and it is now their only source of income. Something that they think is quite unusual in this wonderful breed! !